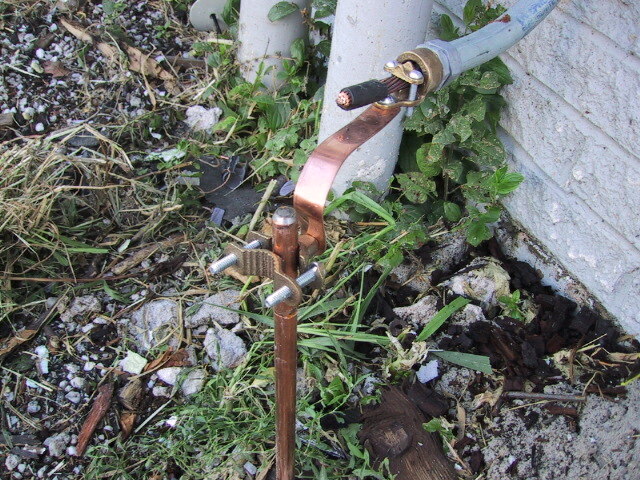 The clamp on the ground rod is 1/2 installed reversed, possibly because it is too large for the rod and would not tighten. Look at page 5 of this pdf. You can get UL listed reversible ground clamps. That water pipe clamp, even if it was turned around is not listed as a ground rod clamp. I also don't know where that copper strap came from. Proper way would have been to use a GEC long enough to reach the ground rod and an acorn or other listed clamp. Hal that clamp may well indeed be listed for that use. The two bumps touching the rod on the 'reversed' part of the clamp are a tip off. From page 5 of the pdf link I posted above. reversible for attachment to ground rods. Bob, that's for a driven pipe grounding electrode, not a solid rod. Was typing when you were. Ok, definite could be. The rod clamp is rated to be used like this. I'd say the biggest violation here is the compression fitting that the Brass Conduit adapter is screwed on to. It could become loose in time. AM I the only one who considers this an improper means of splicing the GEC?